New Bern is located in Craven County, North Carolina at the confluence of the Trent and the Neuse rivers near the Atlantic Ocean. New Bern has a walkable downtown with multiple historic districts. However, the city has few pedestrian connections outside of its core. New Bern does not have a current bicycle, pedestrian, or greenway plan, but there is increased interest in safety for non-motorized road users. Since joining the Watch for Me NC program, New Bern has worked to improve pedestrian and bicyclist safety along major downtown thoroughfares including US 70 and US 17. While New Bern’s Watch for Me NC campaign is managed by the Police Department, this agency has worked closely with several other groups to develop comprehensive education and enforcement activities about traffic safety. In particular, the New Bern Police Department engaged the New Bern Area Metropolitan Planning Organization and the Sheriff’s Office in Watch for Me NC activities. The North Carolina Department of Transportation Governor’s Highway Safety Program has also been a crucial partner. Watch for Me NC partners in New Bern have participated in several local events and festivals to raise awareness about safe bicycling and walking including the Vision Forward Festival and the Bike MS touring event. The Police Department worked with area bike shops to draw attention to the program as well. Watch for Me NC banners have been posted at bike shops downtown and brochures have been distributed to downtown shoppers. Watch for Me NC partners also attended supervisory staff meetings of the Police Department and City of New Bern Board of Alderman to engage decision-makers in the program. The Watch for Me NC program has provided the resources needed to strengthen interest in improving traffic safety. This program and its support have helped provide education and materials such as bike lights to residents and tourists. Sgt. Todd Conway of the New Bern Police Department emphasized that “people got lights who genuinely needed lights, it has been really positive.” Watch for Me NC has also generated local attention through public service announcements and accompanying news articles. 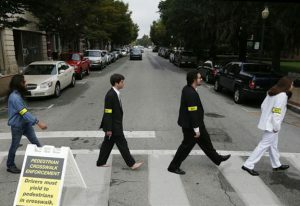 One news article about the campaign pictured pedestrians enacting a remake of the Beatles’ “Abbey Road” album cover. Work within school schedules: The program found it more challenging than anticipated to conduct activities with schools due to conflicts with students’ learning schedules. In the future, this program will seek ways to better integrate programming with after-school activities, or work with day care providers. Thank you to Sergeant Todd Conway with the New Bern Police Department for providing leadership, time and expertise that contributed to the Watch for Me NC Campaign in New Bern and the writing of this profile.